It's Friday, and it's double the fun! Two link-ups! First the nail files! 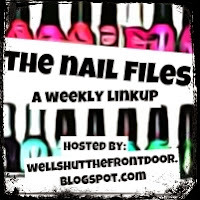 Link up and show off what your nails have looked like for the past week, what you'll be wearing for the weekend, or anything you found/want! 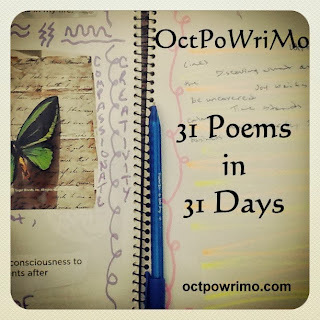 Then, October Poetry Writing Month! You can find out more about that here! I decided to try something different- again- this week. 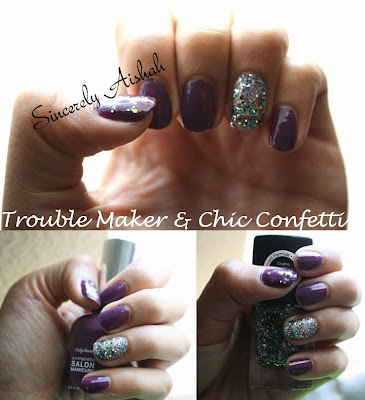 I am wearing Sally Hansen complete SALON MANICURE in (500) Trouble Maker. My ring fingers I painted with Sally Hansen Celeb City (Barely even a coat) and applied e.l.f. Chic Confetti Glitter. I didn't really pain this on though- more like packed it on so my entire nails was covered in the glitter, then smoothed it out. I decided to add little dots of the glitter to my thumbs as an accent. I like that they aren't perfect dots, and it's scattered-this is a look I will definitely by doing again with different colors. As always, I applied a base & top coat. if you stop always being so hard on yourself. instead look at them as your achievements and successes for just that one day. because that is what got you this far. This is a perfect gentle manifesto. I want to print it, put my name a the top, and post it in my studio to remind me of exactly what you've said here every day. Great job! Thank you so much seekingmeme!! That means so much!! Love that glitter! So pretty - I think I have two or three in my stash that look like it.